WE HAVE BEAUTIFUL SAVANNAH KITTENS AVAILABLE! We have beautiful F4C and F5 SBT Savannah kittens born 5/13/16! They are very reasonably priced for their fine quality. Please see videos, photo albums & details by visiting our Facebook Page. Please message us there for more information. 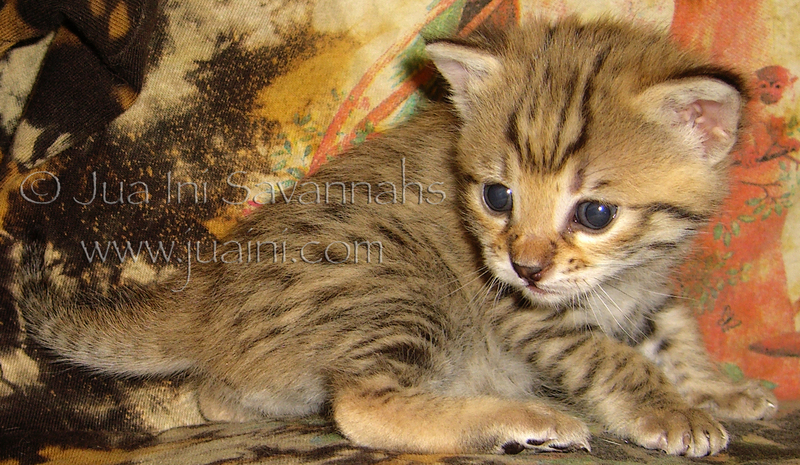 This female BST F2B Savannah kitten was born 5/29/14. She has gone to her new home, but we expect Capoeira will have new F2B Savannah kittens in early 2017. You can see photos of this baby and other prior litters on our Facebook Page. We also have some lovely retired adult Savannahs available for a wonderfully well-matched person or family. Please check our Specials. Our cats and kittens come with a written contract. Prices may change for any kitten or cat who has not been reserved. We offer a discount if you get more than one (to keep together, not for resale). If you are interested in one of our Savannahs to breed, please inquire for our breeder price and terms. Our kittens are raised in our home, cuddled and played with daily. The long term happiness of our cats, kittens and clients is very important to us. So we welcome your questions, and we provide a Pre-Adoption Questionnaire for all prospective clients to fill out. It is very helpful for knowing how to prepare for a new Savannah, and it helps us to know what cat or kitten might be most suited to your desires and lifestyle, and any areas of information we should provide for you. If you would like to see our photos, and be notified as soon as our kittens are born, and as soon as kittens and cats become available, please visit the Jua Ini Savannahs Facebook Page. Once you are on our Facebook Page, for most convenient viewing of our kittens and cats, click on the Photos tab, then click on Albums. You can select the album(s) for any kittens or cats you wish to view. Thumbnail images will appear. You can click for full sized images and view them sequentially. If we have NEW available kittens, they will be in the first albums following the “Thanks & Raves from Clients” album. To view our FORMER kittens, see the albums intermingled with the queen’s and stud’s albums (we try to organize them better, but Facebook seems to have a glitch when it comes to moving older photo albums, We’ll keep trying.). You’ll see our F2s, our F3s, our F4s and our F5s. Enjoy! You can also click Like on the Page, and then check “Receive Notifications”, and you will see updates in your Facebook NewsFeed. 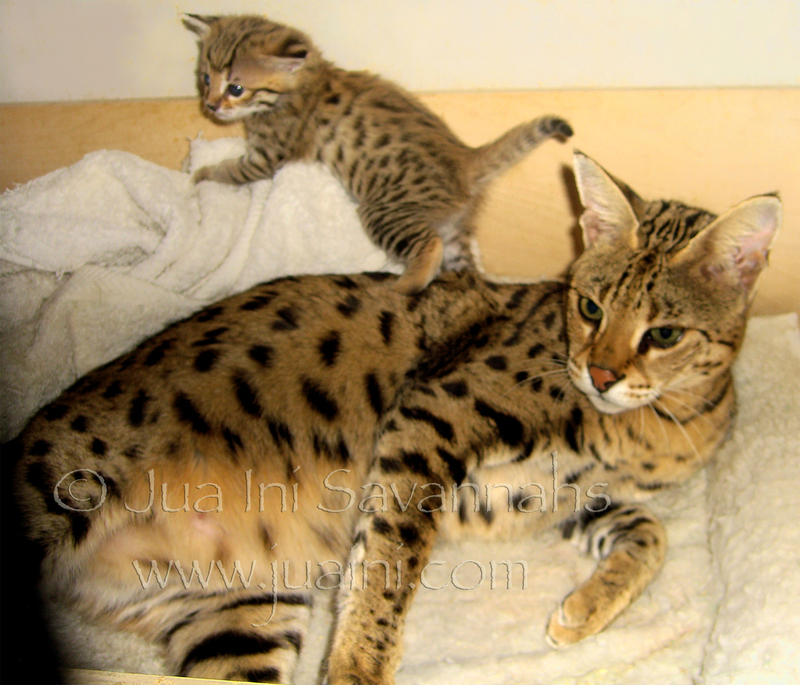 An alternative to Facebook as a way to see our photos, birth announcements and updates is to subscribe to the Jua Ini Savannah Cats list. This is a low volume, announcements only list. To correspond, ask questions, and tell us about what you are looking for, please contact us.